Here are twenty-four photos of the lovely France Gall, spanning 1964 to 1971, from my collection of vintage magazines, photos, and publicity cards. It's hard to pick from the many beautiful photos of this lovable lady, but I chose some favourites here, along with some pictures that fans may not have seen before. Click on a photo to see the full version. Credits can be found below the gallery. This is the first post in a series where I'll be paying tribute to my favourite yé-yé girl by sharing some of my most treasured France Gall-related things, so stay tuned! 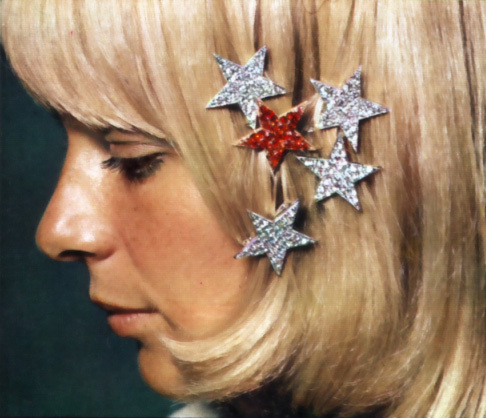 Continue reading "france gall photos, 1964-1971"
Photo: Mademoiselle Age Tendre, November 1969. French pop has lost its long-reigning king. It feels inconceivable – both because the young, beautiful Johnny of fifty years ago lives perpetually in iconic images and sounds, seeming forever 'L'idole des jeunes', and because today's Johnny seemed indefatiguable, still full of a zest for music and life. I really have no words for now that would do an even adequate job of capturing who Johnny was or the immensity of this loss. So I thought I'd just share a collection of few favourite things: photos from those gorgeous, seemingly endless pictorials in the pages of Salut les copains and Mademoiselle Age Tendre (I sometimes wonder how much of their lives the idoles spent in front of the camera! ), some of his best songs, and a few videos that showcase what a charismatic performer he was. Click on any of the photos for a larger version. Salut les copains, December 1963. Beware of my Halloween mix this year: it will magically seduce you, take you to heights of beauty and pleasure... before you soon find unsettling and downright terrifying things start to happen. Erotica and horror combine in this blend of vintage soundtracks, dark folk-pop and other sensual, yet deadly, delights. Please note that this sorcery gets very saucy indeed so you probably won't want to play this at work or around children – unless you're prepared to answer a lot of questions. Credits: Mix illustratiion from the cover of the 1967 gothic romance novel, Strangers In The Night, via My Love-Haunted Heart. Here's a scene from a 1967 French film, Les Poneyttes, in which France's biggest pop star, Johnny Hallyday, performs 'Le Mauvais Rêve' ('Bad Dream'), dressed and painted as a golden statue. I'm not sure exactly why (not having found subtitles for this film), but I'd guess it's a commentary on the god-like status afforded the idoles. The lyrics describe a nightmare that starts in a desolate city, empty but for some zombie-like inhabitants, and ends in a loveless void, with Hallyday assuring himself "it's only a dream... a bad dream". So the idea here is probably to contrast the hollow trappings of stardom and fan worship with an inner fear of true loneliness. It's quite a spectacular, effective scene that suits the epic feel of the song, in what otherwise strikes me as a fairly silly, mediocre film. Continue reading "je suis une idole dorée"
Here, Uta recites the title poet's 'Recueillement' from Les Fleurs du mal over a potent psych rock jam, brimming with fuzzy, heavy guitars, phaser effects and rhythmic electric organ. The song's credits read 'musique de Groscolas', referring to Pierre Groscolas, at the time a songwriter, session musician and backing vocalist, most notably for Eddy Mitchell. Groscolas, who was also a founding member of the sixties band Le Cœur, would go on to find success as a solo singer-songwriter in the early seventies, releasing more standard fare than the striking 'Baudelaire' shows he was capable of conjuring up. 'Baudelaire' is an interesting pairing with the A-side, a cover of The Shangri-Las' haunting 1966 single 'Past, Present and Future'. An unusual girl group release, the original is sombre and stripped back, its arrangement mostly a simple piano accompaniment borrowed from Beethoven's Moonlight Sonata. Over this, lead vocalist Mary Weiss forlornly speak-sings a soliloquoy that captures the devastation and shock of first heartbreak. Uta's version has a slightly sped up tempo and there's a lighter touch to her vocal delivery, but the cover otherwise sticks close to its source in tone and theme, the lyrics a mostly faithful translation. Flip the record over and the change in style is stark. It would seem 'Baudelaire' has nothing in common with the A-side, save for the spoken word vocals. Here you have a psyched-up reading of a weighty, once-banned poem backing an angsty teen ballad about failed first romance. 'Baudelaire' is just the sort of wild experiment that sometimes gets smuggled onto a B-side, where an artist can let loose and express something that the main cut, intended for radio play and chart success, doesn't allow. But looking more closely at the two songs, they may be more of a deliberate pairing than it would seem. It turns out there's actually an intriguing thematic continuity between them. And though the A-side is the more radio-friendly, it's a curious choice for a debut single. A teen pop song from three years prior – an eternity in pop years back then – that didn't quite crack the American top fifty, covered by a nearly thirty-year-old actress, wasn't a likely formula for a hit record. These two things taken together make me wonder if this wasn't more of an artistic endeavour than an attempt to launch a new female pop star. Perhaps it was even, in a sense, a concept single. Continue reading "uta, part two: psychedelic poetry"